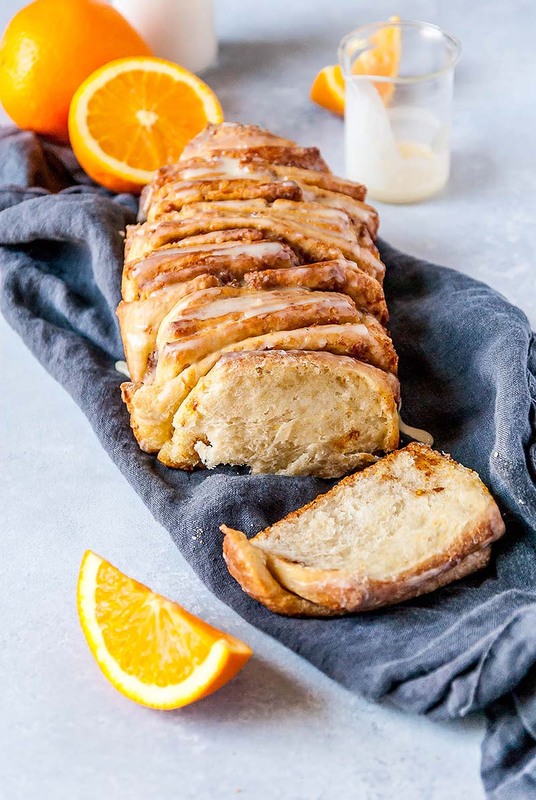 Vegan pull-apart bread that is SO fluffy and perfect, packed with fresh orange flavor, cinnamon, and the BEST sweet orange glaze! In the bowl of a stand mixer fitted with a paddle attachment, combine the flour, sugar, and yeast. Mix until combined. Add the almond milk, olive oil, water, apple cider vinegar, vanilla, salt, and orange zest. Mix on medium until the dough starts to come together. You will probably need to stop and scrape down the sides of the bowl as you are mixing. Once the dough starts to come together, stop the mixer. The dough is going to be very sticky, that’s good! Lightly oil your mixing bowl with olive oil and place dough back into the bowl. Cover with a towel and allow to rise for at least an hour, or until the dough has doubled in size. Once the dough has risen, remove from the bowl and place onto a well-floured surface. Grease a loaf pan and set aside for your dough later. In a small bowl, combine the sugar, cinnamon, ginger, and orange zest in a small bowl. Set aside for your filling. Roll into a rectangle that is 20x12-inches. If dough becomes really sticky as you are rolling out, sprinkle on more flour and keep rolling. Brush the rolled out dough with the 2 tablespoons of olive oil. Make filling: combine sugar, cinnamon, ginger and orange zest in a small bowl. Sprinkle filling mixture over the rolled out dough. Once the rectangle is rolled out and filled, starting with the long end, cut the dough into 5 strips from top to bottom. Stack these strips on top of one another and then cut the stack of strips into 6 equal squares. Place all the stacks of dough squares together end to end in the greased loaf pan. Cover with a towel and allow to rise for another hour. Once the dough has risen the second time, preheat the oven to 350°F. Bake the dough for 35-40 minutes, or until the top is golden brown. While the bread is baking, whisk together all the glaze ingredients in a small bowl and set aside. Allow the bread to cool for at least 10 minutes, then remove the loaf from the pan and top with the glaze. Serve immediately. I have pure orange oil. Is there some way to incorporate a bit of that for a more orange taste? You can definitely experiment with the orange oil to get your desired flavor. 8-1/2 x 4 loaf pan? Use an 8 1/2 x 4 1/2-inch pan. Can you use butter instead of olive oil? After ‘Once the rectangle is rolled out and filled’, instead of cutting it to make it pull apart, can I just roll it and follow the rest of the instructions to bake it? Yes, however you will need to adjust the size of your rolled out dough so that it will fit into your pan. Roll out to a 14×7-inch rectangle, and after adding the filling, start rolling it at the shorter end. You can substitute regular milk for the almond milk if you prefer.